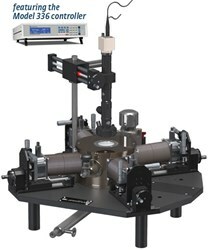 Lake Shore Cryotronics, a leading innovator in solutions for measurement over a wide range of temperature and magnetic field conditions, announced that it will be discussing its soon-to-released terahertz (THz) system for materials characterization at the upcoming American Physical Society March Meeting in Denver. Lake Shore Cryotronics, a leading innovator in measurement and control solutions for materials characterization, announced that it is now offering a fully configured probe station for scientists in need of a basic cryogenic probe station at an affordable price. In response to positive feedback heard at the recent IRMMW-THz conference, Lake Shore Cryotronics announced that it is moving forward with implementing software features that will further enhance the usability of its prototype terahertz (THz) materials characterization platform. Lake Shore Cryotronics will exhibit its materials characterization solutions, including its prototype terahertz (THz) system, at booth 623 at SPIE Optics + Photonics, August 27­­­-29 in San Diego. In addition to the new THz system, Lake Shore offers probe stations and Hall measurement systems (HMS) for complex measurements under variable temperature and magnetic field conditions. Lake Shore Cryotronics Inc. will attend the IEEE MTT International Microwave Symposium 2013 (IMS) in Seattle, WA June 2-7, where it will showcase its family of cryogenic and cryogen-free probe stations for characterizing the performance of early stage devices and materials. IMS is an international gathering of technologists involved in all aspects of microwave theory and practice, particularly those in RF, microwave, millimeter wave, and terahertz (THz) frequencies. Lake Shore Cryotronics will announce its new continuous wave terahertz materials characterization system at the American Physical Society March Meeting 2013. The conference, which will take place March 18 to 22 in Baltimore, is the largest physics meeting in the world, focusing on research from industry, universities, and national labs. Lake Shore announces a new continuously variable temperature (CVT) probe, developed in collaboration with TOYO Corp., that allows for true, continuous unattended wafer probing of a material sample across a range of temperatures. The probes, when used in any Lake Shore probe station, significantly improve reliability of sample measurement. Lake Shore Cryotronics Inc., a manufacturer of scientific sensors, instruments, and systems for precise measurement and control, introduces updated specifications for the Model CRX-VF Cryogenic Probe Station, which features increased maximum magnetic field, improved magnetic field at elevated sample temperatures, and improved vacuum performance. p> Lake Shore Cryotronics Inc., a manufacturer of scientific sensors, instruments, and systems for precise measurement and control, announces that it will be speaking about a rugged terahertz (THz) photomixer package specifically developed for cryogenic operation, at the International Conference on Infrared, Millimeter, and Terahertz Waves (IRMMW-THz). The conference will be held Sept. 23-28, 2012, in Wollongong, Australia.